Update: see also Clay Shirky’s brilliant talk explaining SOPA and PIPA, and why they were drafted. You should blackout every language version. The whole world is against of this dumb law. – Jesús Manuel O.
Wikipedia… is a source for great knowledge. Wikipedia team is not an ordinary team. A G R E E !!! – George MacNabb, M.D. It is very disappointing to see what my people are trying to fight here is emerging in the U.S. This is actually a very serious decision. In all its years of existance, i have never seen Wiki go down. Just yesterday, a national stock exchange was DDOSed and hence out of service. I have seen the PSN go down. I have seen gaming clients’ networks go down. I have seen news clippings of “such and such site attacked and compromised”. But never Wiki was attacked or down, because everyone accepts it to be a neutral ground, a safe no-nonsense ground, where everyone turned to for information, regardless of language.This is one of the unwritten rules of the internet. This blackout just shows how serious this SOPA and PIPA problem is. I think we can cope without Wikipedia for 24 hours if it is for something like this. We should not be bullied. piracy… is a very real economic threat to the creative community. However, the methods by which these acts combat it are heavy-handed and overreaching; like fighting cancer with grenades. I am an artist who is opposed to piracy, and I applaud Wikipedia for this stand. No argument is available why it helps or is good for media companies to not have protection. Who cares anyway, it won’t hurt Wikipedia. Or does Wikipedia now plan to host copyright content. I fear a world in which someone might be sued for humming a tune or quoting a line from a movie! 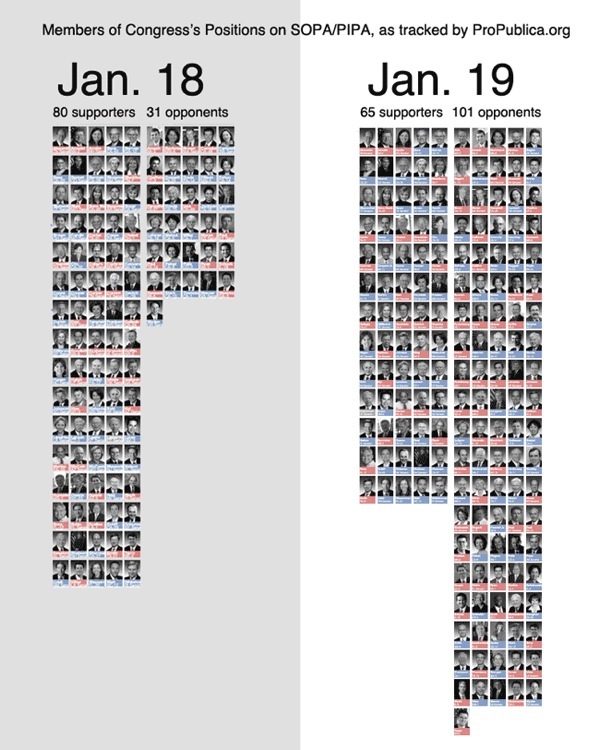 How many politicians announced they would be co-sponsoring or otherwise outright supporting SOPA/PIPA on Wednesday? By our count: Zero. We are experiencing the growth of social unity and a certain moral sense across the Web, among people who have found something wonderful, worth defending with all their heart. This is a small piece; it is thrilling to be part of it. I hope you feel it too. Over a dozen Congressmen have changed or clarified their position on PIPA and SOPA over the course of the past 36 hours, towards opposing the bills. This includes six senators and two representatives who had previously been co-sponsors or solid supporters of the relevant bill in their chamber. Many more who formerly were neutral about the bills or leaning towards opposing them, are now calling them “misguided”, saying they will “cause more harm than good”, “harm free speech rights”, “weaken freedom of expression on the Internet”, and would “harm Internet innovation and jobs”. Most agree that the bills as written “need to be stopped”. It seems that some of them have looked at the bills with a magnifying glass for the first time. Senator Boozman summarizes: “Over the past few weeks, the chorus of concerns over Congressional efforts to address online piracy has intensified“. A week ago it looked like there might be a straight 60-vote approval of PIPA in the Senate; now it is losing suppoters by the hour, and may have a hard time getting majority support; making it unlikely to make it to a vote at all. Politico and others suggest that much of this movement was a direct result of the strong online statement made by the EFF, Reddit, Google, Wikipedia, and others – and the protest organized by those groups to express their views to every representative and senator in the country. Wikipedia produced a ‘find your local representative’ widget, to ensure that we encouraged readers to call their representatives directly; Google simply encouraged signing a petition. 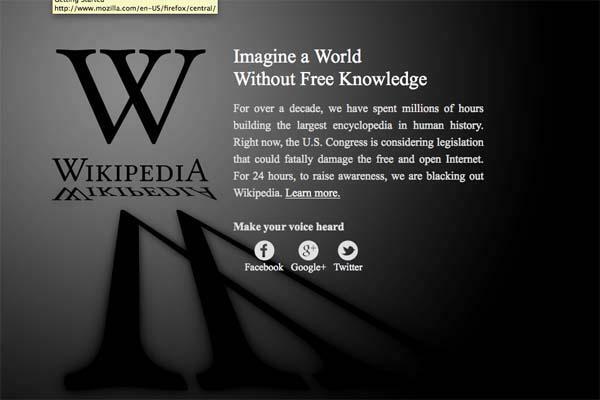 Once the blackout launched, it trended worldwide on Twitter, with hashtags such as #factswithoutwikipedia, #SOPAstrike and #wikipediablackout. At one point, according to Trendistic, #wikipediablackout was used in 1% of all tweets. Hotspots claims that SOPA (and #SOPA) has accounted for a quarter-million tweets an hour since then. The EFF reports that by 5pm, over 250,000 1 million people had contacted their representatives through the EFF blacklist site. Wikipedia reports roughly 160 million people have seen their blackout page, and eight million of those have looked up their elected representatives’ contact information through its tool. (No word on how many made contact; if there is a dropoff rate similar to the first clickthrough, then that would make another 400,000 contacts.) Google reports gathering 4.5 million signatures on its petition. I oppose PIPA…Online piracy needs to be addressed, but the current form of the bill isn’t the proper way to do it. 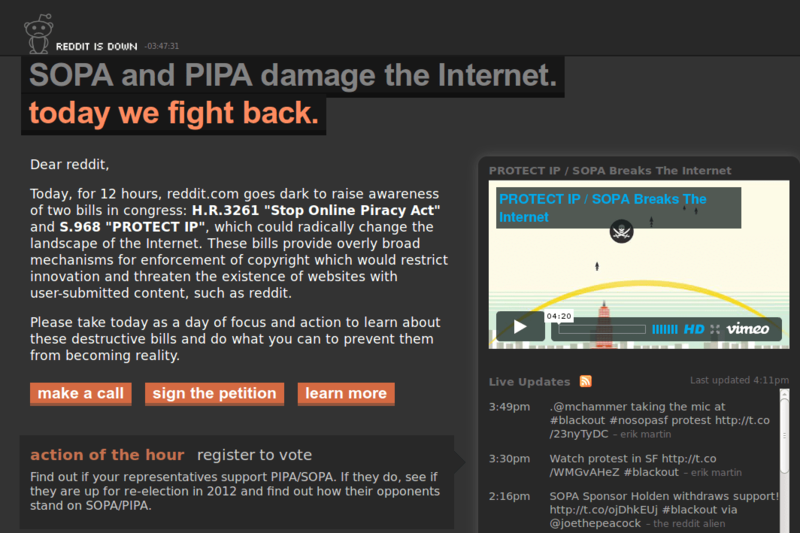 I support intellectual property rights, but I oppose SOPA & PIPA. They’re misguided bills that will cause more harm than good. Freedom of speech is an inalienable right granted to each and every American, and the Internet has become the primary tool with which we utilize this right… This extreme measure stifles First Amendment rights and Internet innovation. Thanks for all the calls, emails, and tweets. I will be opposing #SOPA and #PIPA. We can’t endanger an open internet. The bill raises serious concerns about our civil liberties. That’s why next week I plan to oppose the current PIPA bill. SOPA: better to get this done right rather than fast and wrong… the potential impact of this legislation is too far-reaching to ram it through Congress. #NJ: I hear your concerns re: #PIPA loud & clear & share in these concerns. I’m working to ensure critical changes are made to the bill. Copyrights must be protected, but not at this cost. Open internet and free speech! I do not believe it is the responsibility of Internet service providers to become the police of the Internet. Piracy should be prosecuted, but I have deep concerns about SOPA’s effect on free speech rights and am opposed to it in its current form. SOPA as it exists today… should be scrapped entirely. An axe instead of a scalpel, this bill would unacceptably and fundamentally change the architecture of the internet. 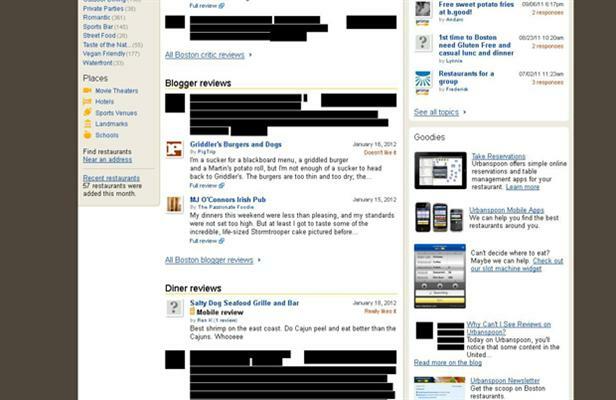 Wikipedia, Craigslist and others are dark today to bring attention to the atrocious SOPA bill that will take away freedom on the internet. I want to thank everyone who has taken the time to contact me about SOPA… Without serious changes I’m not convinced SOPA effectively solves the issue and am concerned about the implications it would have for online innovation. #SOPA would harm internet innovation and jobs. Better ways to fight piracy. I oppose #SOPA because I’m concerned it will restrict free speech. We’re getting a bunch of questions this morning about the ‘Stop Online Piracy Act.’ I wanted to let you know that I oppose the bill. This legislation has moved beyond protecting legitimate intellectual property rights and is now headed down a path that would let companies decide what you get to view online. The bills as currently constructed, with overbroad definitions, will do much more harm than good, hurting the very people they are supposed to protect. Given the widespread coverage the Stop Online Piracy Act (SOPA) has received, I want to let you know that I oppose it in its current form. I oppose #SOPA. We must protect innovation without weakening free expression on the Internet. the way these bills are currently written does not ensure an open and free internet and that is not something I can support. I oppose SOPA or any bill abridging freedom of speech. SOPA in its current form is far too close to internet censorship, something I strongly oppose. I’ve heard from many of you about the “Stop Online Piracy Act” (SOPA). 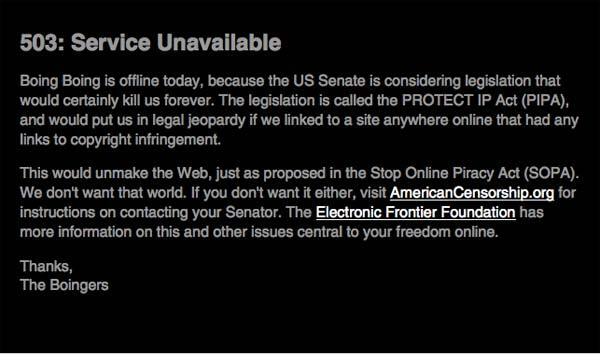 We need to do something about online piracy, but this bill is not the right way to do it. 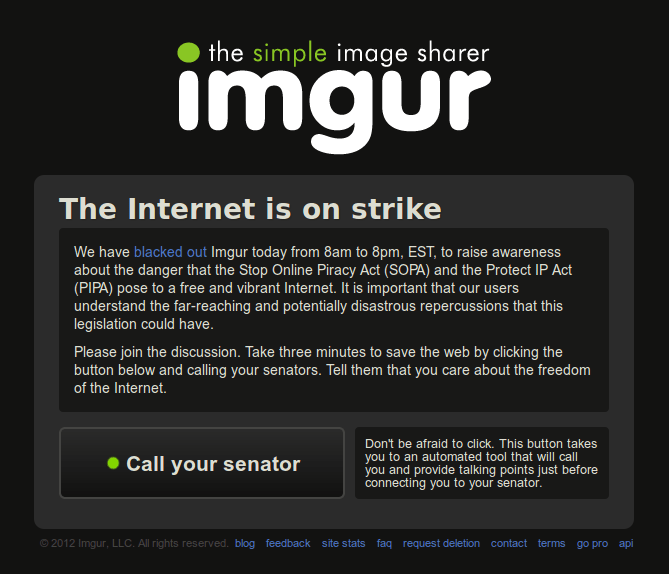 I oppose #SOPA. Keep the internet open. I’ve gotten a lot of calls from people today urging me to oppose SOPA (or PIPA, as the Senate companion bill is called). I do oppose the bill as it’s currently written. I am opposed to the proposed SOPA bill… Today’s ‘black-out’ campaigns by Google, Wikipedia and other major websites echo the voices of the many constituents I’ve heard from. We can protect intellection property through anti-piracy legislation w/o censoring free speech or stifling innovation. #SOPA is not the way. these measures, if enacted, would place unacceptable limitations on the accessibility of online information and content, impose undue burdens on small and innovative websites and applications, and would not be the most effective way to curtail overseas illegal piracy and theft of intellectual property. SOPA, as currently drafted, isn’t the solution. Thanks for your calls and emails this morning. I am opposed to #SOPA. A doff of the hat : Much of this data comes from or was confirmed through ProPublica‘s excellent timeline of public statements by Congressmen about SOPA and PIPA.